As part of our series on nuclear fusion power, this post is going to look at fusion fuel cycles. Fusion fuel cycles are the different ways that fuel nuclei can be combined to make heavier elements. It is convenient to think of them as analogous to chemical reactions, which have reactants, products, and some energy absorbed or released. We are only considering reactions that are exothermic (they release energy). Understanding the source of the sun’s energy was a problem for physicists in the past. Temperatures are not high enough in the center of the sun for protons to overcome the coulomb barrier if analyzed using classical mechanics. With the application of quantum mechanics, physicists began to understand that the protons in the sun are quantum tunneling in order to undergo fusion. Quantum tunneling, for those of you who are new to the concept, is a term describing the ability of quantum particles to end up located in places that they should not have been able to get to according to classical mechanics. This is because they can ‘tunnel’ through barriers with some probability. The key concept is that a quantum particle seems to be able to cross any barrier. Although the greater the barrier, the lower the probability is that the particle will successfully tunnel. In the case of the proton-proton repulsion (since both are positive), there is a very substantial barrier to be overcome. This is one of the fusion reactions that powers the sun. This is a very ‘slow’ process in the sun. A given proton would have to wait an average of 109 years to undergo fusion with another proton1 . This is primarily because the energy and density conditions in the core of the sun are not sufficient to overcome the coulomb barrier without quantum tunneling. Another contributing factor to the improbability of this process is the fact that it relies on a weak nuclear interaction. Weak interactions are in general much less likely than strong interactions. This means that even if one of the protons ends up tunneling through the coulomb barrier to be beside another proton, the chances that they will fuse are still very low. People familiar with atomic physics may know that a double proton system is not allowed by the laws of nuclear physics as we understand them. So this double proton state only exists for an extremely small amount of time. One of the protons needs to undergo a weak interaction to become a neutron, so that they can form a stable state of proton + neutron, which is deuterium. Despite its slow rate, this is the dominant energy source in our sun, and in stars of similar or lighter mass. In our sun, hydrogen is converted to helium primarily through the proton-proton chain. What is the net effect of the entire process? Four protons are turned into a helium nucleus (also known as an alpha particle), a few neutrinos, and 26.73 MeV of energy. There are multiple pathways that this reaction can take after the first step. We presented here the reaction pathway that is most common in our sun. Unfortunately the proton-proton cycle is completely infeasible for fusion reactors on the earth. Even in the center of the sun (at very, very high pressures and temperatures) the power density created by proton-proton fusion is very small. Estimates have placed its power density at a value that is actually about one quarter the power density of the heat created by a living human being.2 Similarly low power densities apply to the next solar fusion cycle we look at, the CNO Cycle. If our sun was 1.5+ times larger, we would instead see a dominant reaction in the form of the CNO cycle. CNO stands for Carbon-Nitrogen-Oxygen. The heavy nucleus, which changes character between carbon, nitrogen, and oxygen due to the nuclear reactions, acts as a catalyst. The heavy nucleus is transformed during the cycle, but is not consumed in the cycle. This is also known as the Carbon Cycle. This is problematic because it may cause some confusion with the earth’s carbon cycle. The net effect of once around the CNO cycle is to turn four protons into: an alpha particle, two positrons, some gamma rays, and neutrinos. The net energy released in one cycle is 26.8 MeV, but we also released positrons which are going to be immediately annihilated when they encounter an electron. This raises the net energy released to 27.8 MeV. Now we are looking at nuclear fusion fuel cycles that have a real possibility of being used for terrestrial power generation. For D-D, the fusion reaction rate peaks at a temperature of 15 keV, which may be attainable in terrestrial reactors. This number will be useful for comparison to the next few processes we look at. Deuterium is available in large quantities in the earth’s oceans even though it only represents a small fraction of all hydrogen on earth (about 0.0156%)3 . This is a fuel source that we can rely on for a very long time into the future, assuming that we can make it work in the first place. It is important to keep in mind that hydrogen is the most common element in the universe. What are the advantages of D-D fusion? These fusions are strong interactions for which the conditions are relatively easy to create. We also only have to worry about one fuel that is relatively easy to acquire. The helium that is produced can also fuse with a deuterium. We look at this case later on. D-He has a much higher peak reaction rate energy, so it is much less likely to fuse in a plasma that has been optimized for D-D fusion. This reaction also produces tritium, which can also be burnt in a second-stage fusion reaction since the minimum energy for D-T fusion is even lower than it is for D-D.
D-T has some properties that make it more desirable than D-D. Even higher cross section than D-D. This means that when the ions interact closely, there is a higher probability of a D-T reaction than a D-D reaction. This leads to a reduced Lawson criterion, which means that the conditions of fusion are easier to accomplish. Reaction rate peak at 13.6 keV, which is even lower than the 15 keV for D-D. Blanket of Lithium required for breeding tritium. Tritium does not occur naturally on the earth, we need to make it out of other things. The way to usually do this is a blanket of lithium that gets bombarded with neutrons from the reactions. Lithium bombarded with neutrons will produce tritium, which can then be used as fuel. This is however an interesting technical difficulty. Also, tritium presents some nuclear proliferation concerns. 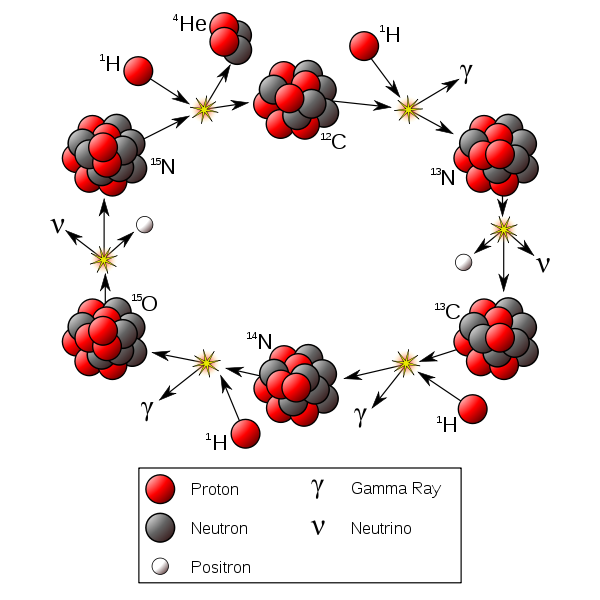 Neutron carries off 80% of energy. This means that only 1/5th of the total fusion energy even has a chance of staying in the plasma. Attaining ignition will be fairly difficult. Also, the radiation flux of neutrons from one of these reactors would be very intense. This introduces design difficulties for possible reactors. This is considered the most likely fuel cycle for use in tokamak reactors since it has the lowest temperature requirements of the terrestrial fusion fuel cycles. Muon-catalyzed fusion can be done at lower temperatures. When we look at it in detail later on, we will look at how it is currently impossible to build a muon-catalyzed fusion reactor. How can we avoid the serious neutron radiation problems inherent in these fuel cycles? It turns out that there are some fusion reactions that produce very few neutrons. We will look at some of them now. In this fusion reaction, deuterium is fused with helium-3, the lightest isotope of helium. This reaction is aneutronic. That is, the main pathway for the fusion creates no neutron radiation. Some neutrons would be produced due to side reactions of D-D for instance. However, with the dramatically reduced neutron radiation, this could mean much less expensive shielding will be required for the reactor. Direct conversion is possible. Direct conversion, which we will go into more depth on later, is the process of extracting energy from fast-moving charged particles and turning it directly into electricity. There is no ‘heating’ stage, where we heat up a coolant like water and run it through steam turbines. Direct conversion may allow for very high efficiencies (>90%) compared to thermal conversion (40-50%). For a complete look at how this is possible, see our introduction to direct conversion. Reaction rate peaks at 58 keV, a very high temperature compared to D-D and D-T. The acquisition of Helium-3 is problematic enough that consideration of another aneutronic fusion fuel cycle is warranted. Proton-11Boron is another interesting candidate, and the last fuel cycle that we will look at in this article. Aneutronic. Even fewer neutrons will be produced with this reaction than with D-He. This is a reaction ‘clean’ enough that it may not pose any notable neutron radiation risk. Neutronicity of this reaction has been estimated at around 0.001. This means for every thousand fusion reactions, there will be one neutron emitted. Direct conversion possible, just as with D-He, because all of the products are charged particles. Very great fuel availability. Fuel is easy to find and there is lots of it. There is only one major disadvantage to this fuel cycle, but it is a big one. The reaction rate peaks at an energy of 123 keV! This is a very high energy, so high in fact that many people consider this fuel cycle to be a dead end in terms of research. There are, however, some proposals for reactors which we will discuss in later posts that might be able to reach energies this high. This would be preferable, since if we can design a reactor to use an aneutronic fuel cycle with direct conversion, we would be well on our way to an energy source for the next millennium. You might be wondering how boron-11 can break up into three helium-4 nuclei. This looks like fission, where a heavier nucleus is broken up into smaller pieces. This is however not the case. 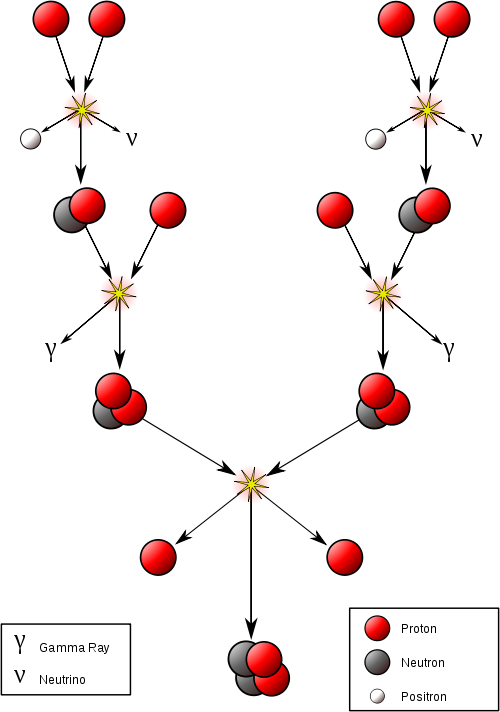 What actually happens is the proton and boron-11 fuse, forming an unstable carbon-12 nucleus. This nucleus then decays to three alpha particles. The reason this is energetically possible is because helium-4 is one of the most stable isotopes in the universe. For a more in-depth discussion of this phenomena, see the Wikipedia article on Nuclear binding energy. Next we will look at a reaction that is not another fuel cycle, but a way to catalyze one of the above fuel cycles. What is a muon? Imagine an electron that is about 200 times as heavy as a normal electron, and decays away into other particles after only about 2.2 milliseconds. When a muon instead of an electron is orbiting a nucleus, it does so at about 1/200th the distance that an electron does. This has the effect of lowering the coulomb barrier substantially. This means that fusion can be accomplished at much lower temperatures. In fact, it lowers the minimum temperatures so much that fusion can easily occur at room temperature. In fact, muon-catalyzed fusion experiments are often conducted with the fuel elements frozen into a solid block at -270ºC, within a few degrees of absolute zero. However, we cannot use muon catalyzed fusion for power production unless we solve a couple major problems. The first is ‘alpha sticking‘. As mentioned before, an alpha particle is a helium nucleus. This means that it has two protons and two neutrons. Thus it has a net charge of +2. This means that the attraction between the muon and the alpha will be higher than between the muon and a proton. This causes the muon to stick to alpha particles rather strongly. Since alpha particles don’t undergo fusion under these conditions, it means that the muon is then essentially lost, since it will decay after only ~2.2ms. Additionally, a heavier fuel ion such as boron-11 will likely have several electrons around its nucleus. This would mean that the effect of a single muon would be a lot less than it is with hydrogen (which only has one positive charge). Heavier fuels are thus not helped substantially by muon catalyzation. The best catalyzing achieved so far is about 100 fusions per muon. New research indicates that 200-333 catalyzed fusions per muon may be possible. The problem is that the theory says we probably need about 500 fusions before being attached/decaying because of their energetic cost of production. In order to utilize muon-catalyzed fusion, humans need to develop an energetically cheap source of a very large number of muons. Currently the energy cost per muon is around 6 GeV, far more than the net energy gained from its catalyzed fusions. Unfortunately this technique doesn’t really work with multiple electron atoms. We would need a LOT of muons, far more than is generally considered feasible. We have seen some references to new and interesting developments in the area of high efficiency muon production from pion interactions. However, we haven’t seen the science on which these claims are made. It is very unlikely that muon-catalyzed fusion is anywhere near being economical, even if relatively large leaps are made in producing the muons. With that, we conclude this installment of our nuclear fusion power post series. Stay tuned for our next publication, which will look into the details of exactly how we hope to create machinery that can contain plasma and extract fusion energy from it. p-B11 is very promising, 123 keV is not so impossible after all. With few power consumption, the electrostatic acceleration can easily attain to 600keV. This is very interested but does not answer a question that I have not seen addressed anywhere. The D-D reaction to produce an alpha particle would release a lot of energy, but is never mentioned. My guess is that it would leave the alpha particle in an excited state, but it cannot release this energy by emitting a gamma ray because that would violate angular momentum conservation. Is that correct? The D-D reaction is covered in this article, and there are further resources online such as Wikipedia. The main reaction doesn’t create an alpha particle as far as I know, it follows the two processes cited above.